Thanks to all who have purchased books or other items through Amazon.com.� Our 2006 Amazon sales have now exceeded $75,000, which helps our website financially without costing you anything.� We now list books discounted at least 10% by Amazon.com on our Books page under Discounts (from the Home Page, click on the Books button).� In addition, for Lippincott books, visit www.Lww.com and use discount code W5ECA1ZZ to get a 10% discount. 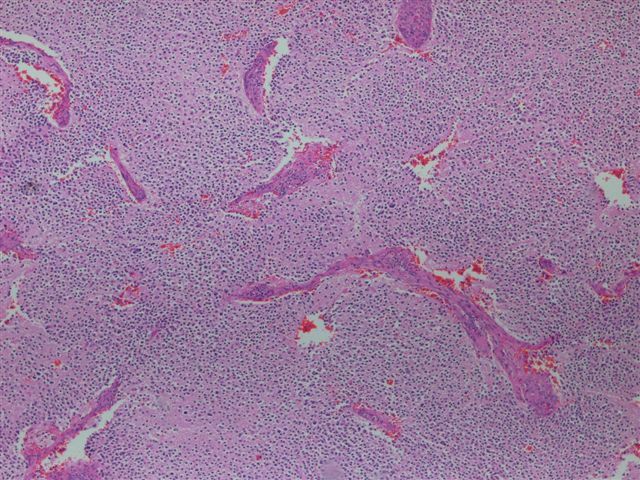 A two year old child had an abdominal mass, which was excised. Neuroblastomas are the fourth most common malignancy in children, after leukemia, medulloblastoma / PNET and astrocytoma.� There are 500 new cases per year in the US, but they are rare in adults.� They are the most common tumor before age 1 year, and 80% occur by age 4 years. The typical presentation is a young child with a large abdominal mass that may fill the abdomen or thorax, accompanied by fever and weight loss.� There are usually increased levels of catecholamines, but without symptoms.� Although most tumors are adrenal, one third occur in the head and neck, mediastinum or pelvis. 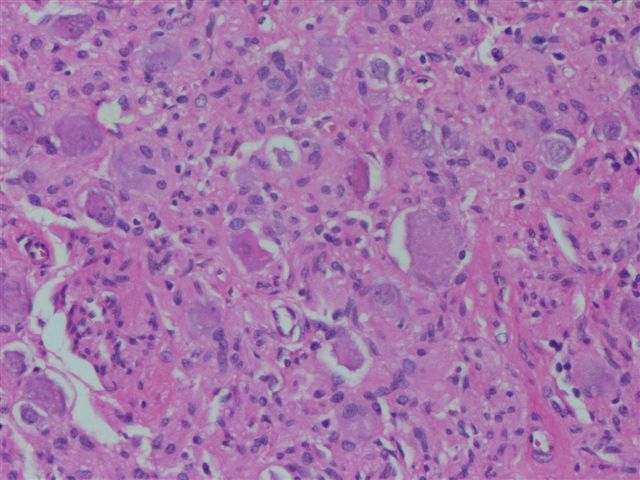 Grossly, the tumors vary from minute, in situ lesions, to masses up to 1 kg.� They are usually well circumscribed (image), composed of soft, gray-pink, brain-like tissue (image).� Large tumors may have hemorrhage, necrosis (image), calcification or cysts.� Tumors may be locally invasive to liver or pancreas. Microscopically, these tumors are vaguely nodular due to incomplete fibrous encapsulation.� They are small blue cell tumors with minimal cytoplasm, hyperchromatic round nuclei and poorly defined cytoplasmic borders.� Homer-Wright pseudorosettes (tumor cells surround central spaces filled with fibrillar extensions of cells without a central lumen) occur in 25-30%.� There is often neuropil (fine fibrillary matrix) between tumor cells.� Areas of hemorrhage may have alveolar, pseudovascular or Schiller-Duvall bodies.� Cells often have varying degrees of ganglionic differentiation. Numerous classification systems and staging systems have been devised, which are described in the Adrenal Gland chapter with additional references. 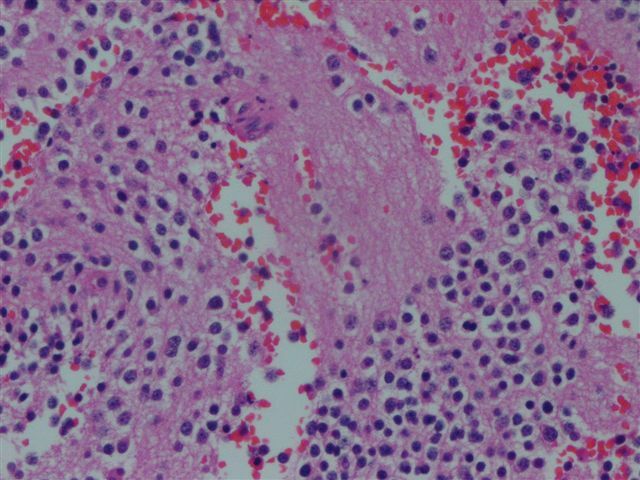 Neuroblastoma is immunoreactive for neural markers, such as chromogranin, synaptophysin, neurofilament and neuron-specific enolase, as well as vimentin and ALK.� It is negative for keratin, CD45, CD99 and desmin. 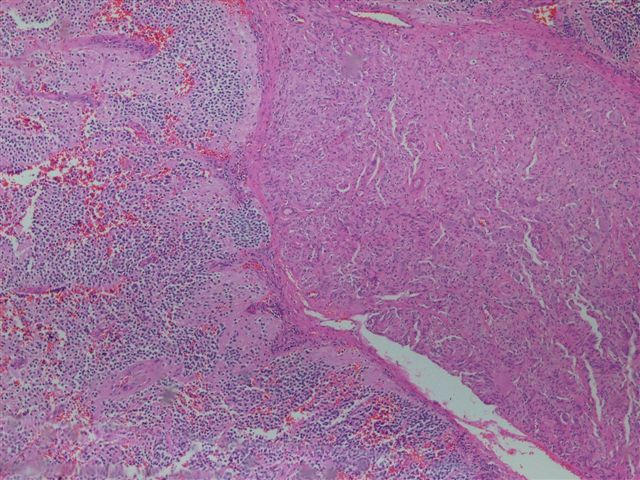 The differential diagnosis of abdominal masses composed of small blue cells in young children includes rhabdomyosarcoma (strap cells, rhabdomyoblasts, positive for muscle markers) and Ewing�s sarcoma/PNET (usually does not present with metastatic disease, older children, no neuropil, CD99+, chromogranin-).� Other entities to consider include lymphoma, desmoplastic small round cell tumor and monophasic Wilm�s tumor. Treatment consists of surgery, chemotherapy and possibly bone marrow transplantation.� Unfortunately, the five year overall survival is only about 35%, although this varies based on the prognostic factors discussed in the Adrenal Gland chapter.